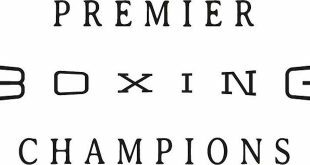 On a second consecutive night of fights on ShoBox: The New Generation on Showtime, featherweight Luis Orlando “Orlandito” Del Valle’s rising star shined in a 10-round unanimous decision over Dat “Be Dat’’ Nguyen with scores of 99-91 three times. 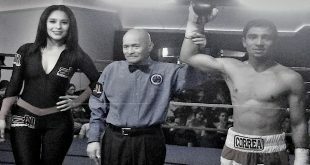 In the co-feature, Jonathan Gonzalez scored a convincing 10-round unanimous decision by the scores of 99-91 and 98-92 twice in a junior middleweight matchup over Richard Gutierrez from Roseland Ballroom in New York City on the eve of the Puerto Rican Day Parade. Del Valle (13-0,10 KOs), of Bayamon , P.R., impressed the boisterous Boricua-based crowd and Showtime announcers alike with his sharp shots and well-timed counter punches. Known for throwing a high volume of shots, Nguyen (17-2, 6 KOs), a resident of Vero Beach, Fla., came out swinging but Del Valle anticipated Nguyen’s wide punches with crisp counters. The two exchanged many times throughout the early rounds with Del Valle winning the upper hand nearly every time. As Del Valle’s face bore only a small cut under his right eye, Nguyen’s slug-marked mug swelled more and more with each passing round. 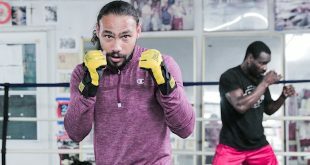 Though Del Valle, who was taking a big step up in level of opposition, proved that his name belonged higher on the prospects to watch list, Nguyen showed a tremendous amount of bravado – and a granite chin – as he refused to give up or even hit the canvas. Beginning in the sixth round, Del Valle dominated the fight by teeing off on Nguyen against the ropes where Nguyen couldn’t counter with more than a few unwise “bring it on” taunts at the surging Puerto Rican. The crowd got behind the 24-year-old Del Valle as he closed out the best performance of his young career. The night’s opening bout began before the bell as both contestants shouted insults to one another from across the ring. The fight started with two action rounds to the crowd’s delight that saw Gonzalez unload countless power shots and Gutierrez returning with hard counters. As the scrap settled into the third round and beyond, the fighters were warned about multiple fouls by referee Gary Rosato from low blows to hitting behind the head and the clashing of heads. In the 6th round, Gonzalez began to pick the action back up and unload heavy shots to the head and body of Guttierez but ended his barrage with a low blow that gave Gutierrez some much needed time to recover. Gonzalez stayed active through his first career distance fight winning a satisfying unanimous decision. 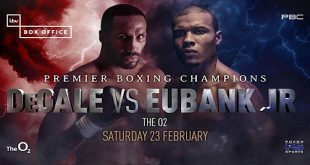 The card was co-promoted by DiBella Entertainment and Gary Shaw Productions. The telecast will replay this Thursday, June 16 at 10:30 p.m. ET/PT on Showtime Extreme and be available On Demand beginning June 14 through June 27.